AA EDM makes wire guides to order. Send us a print, we'll make you a guide. We'll make it with a long-lived, patent pending ceramic. We'll make it to hold a wide range of wire sizes. 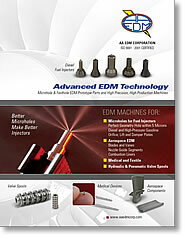 And we'll make it cost-effective: you'll EDM more holes per dollar with AAEDM. • Durable: They EDM up to 500,000 times. • Flexible: They guide a wide range of wire diameters. • Affordable: Their price is competitive. AAEDM Rotary Tables for Tilting the EDM head or indexing the work piece.